Happy New Year everyone! We hope you enjoyed your holiday weekend. Did you set any goals for the new year? One of our goals here at ACF was to get more involved in blogging and social media. In the process, we’ve been doing a lot of research and reading some books on the subject. 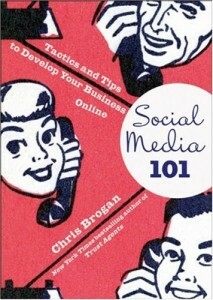 If your business is looking to get more involved in social media, a book we recommend is Social Media 101 by Chris Brogan. It was a great read! The information in this book is useful for both social media beginners and people looking to build on their current presence. When it comes to social media, Chris Brogan gets it and everything he talks about in the book are things he actually practices. The book is packed with information, useful tips and tactics in an easy to read package. ACF highly recommends it to anyone looking to get more involved with social media! Have you read any other social media books? Any recommendations?